This story took place a long time ago or it may even be in the future. Nobody knows exactly which year it was. In any case it was a time of dramatic changes, and it was also the time when the Jesters became more organised and influential. This coming together of the Jesters was causing difficulties for the national and local leadership. Just previous to this, very different balances of power had been the order of the day. For instance, at that time ‘being right’ was determined by the function and the position of a person rather than by them being able to present sound arguments or well-grounded reasons. This system caused a desire in all people to be found to be right as well. So legally established titles, such as lawyer, manager, president, public notary and so forth, provided a person with the power to be right, but whether such people were in fact right varied from moment to moment. It was really more a matter of the effect of being right than about actually being right. It was a misleading situation, as the public, sometimes en masse, agreed that so called ‘important people’ were always right, without ever having thought about the matter for themselves. The Jesters, however, changed all this. The first one who successfully questioned this ‘lifelong identity card of being right’ was the City Jester of Utrecht. Here follows his story, after which nothing would ever be the same again. It was during one of the hottest summers of the century, one weather record after the other was being broken. The country was in an uproar. The philosophers, sages, senators, judges and politicians had been summoned to the Court to investigate a case involving the City Jester of Utrecht! And hence the Jester had been accused of undermining the State. The parliamentary and extra-parliamentary commissions, under the guidance of the King, had prepared a small castle just outside Utrecht and it was here that the Commission of Truth started their interrogation of the City Jester. Naturally, the Court Jester of the King was not allowed to appear. 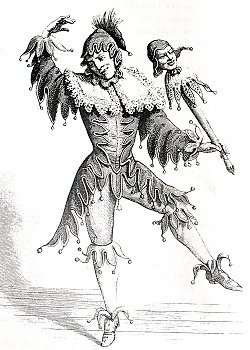 Two Jesters could not be in the same place at the same time - especially not in any judicial process – this was a matter settled in law, as this double presence was considered to be too deranging to the minds of those attending. He spoke with a great sense of drama, while pointing at the row of name plates in front of the 7 members of the commission, each inscribed with an impressive title. A great tumult started amidst the high representatives but after a commanding signal from the King they quietened. The atmosphere trembled with tension. Reluctantly the seven representatives turned to the task, though not without grumbling. They had the feeling that they themselves were on trial rather than the City Jester of Utrecht. Eventually the written answers were handed over to the King who read them aloud, one by one. When the tumult in the Hall had quietened down it was the Commission’s turn to deliver various fiery arguments. None were in favour of the City Jester of Utrecht and the atmosphere in the public gallery began to turn against him. The arguments from the Commission gave most people the impression that the Jester was pleading for a radical abolition of personality, personal style, unique clothing or even of having a mind of one’s own. The Jester became more and more isolated as his words were cleverly twisted. And so it happened that almost no-one could or would testify in favour of the City Jester of Utrecht, who quietly, and seemingly unaffected by it all, sat waiting at the table, holding his pen in front of an empty sheet of paper. The City Jester smiled encouragingly at his student and had the plea registered as the sole evidence in his case. Now although this case was lost and the City Jester was sentenced to a lengthy punishment of community service, the changes that had begun could not be held back anymore. Who am I? or, Why is identity important? Identity is a tool for making our experience conscious. Identity is the coherent condensation of conscious choices. Identity is an interface that makes what we have chosen harmonious or not. Identity is a dynamic translation station of the unknown. Identity is not something to possess but to use, to change and develop. Identity is a higher art form. In what image do we create our identity? Identity is far more what we will NOT do, to enable what we WILL do. Identity is the integrity of the many roles we take on each day. Identity is the way we react to that which is needed and important. Identity is NOT what we become through time, nationality and religion, school, our friends and parents..., but what we are by how we ourselves respond to all these things.